AmeriCorps Week 2018 is almost here! Mark your calendars for March 10-17th for a week that celebrates YOU, our service members. To see all the events, go over to our Facebook page, or check out our Eventbrite page. We can't wait to see you there. Did you know most AmeriCorps members qualify for SNAP benefits to supplement the living allowance? If you didn’t, it’s not too late! Click here to apply. At the suggestion of a colleague, friend, and former Minnesota GreenCorps member Cassandra Schueller, I have put together a list below of some additional uses you may not have thought an EBT card could provide. Before we dive in, I’ll run through a quick description of the application process for those who are hesitant or unsure how to apply. Feel free to skip down if you’ve already got a card. 5. If the case worker tells you additional documents or proofs are necessary, follow up on those instructions promptly. IMPORTANT: your case will close 30 days after the day you submitted the initial application if the documents are not received on time, so don’t procrastinate. You will then have to reapply all over again. This is different from a rejection, where the DHS decides you are not eligible for SNAP benefits. In that situation, it is possible to contest the decision, but that’s a separate process I won’t go into here. 6. Once everything is submitted, it will take a week or two for the DHS to process your case. They will mail you an EBT card if you are approved. 7. The letter will inform you of the date for a mandatory orientation. Again, expect no more than a 5 day notice. 8. Attend the orientation. Inform the case workers that you are in AmeriCorps, and if your service is greater than 30 hours/week, they will exempt you from the career workshops and monthly career counselor appointments. Alright! Now that we’ve gotten past all of that, let’s get into what that EBT card is good for. Buy food at farmers markets. EBT cards work at grocery stores of course, but they can also be used to buy local goods from local vendors. At participating farmers markets around the state, you can use your EBT card to purchase fresh produce, meats, honey, and other foodstuff. Look for signs for the EBT booth, swipe your card to exchange your benefits for tokens, and shop away. As further incentive, Market Bucks will match purchases dollar to dollar, up to $10 per day. Read here for a more complete breakdown. Click here for a map of all the markets in Minnesota accepting EBT. Sign up for a CSA. If you’ve never done a CSA (community supported agriculture) before, it’s a great way to support local farmers while getting a supply of fresh produce throughout a season or a year. Pick up or delivery options are often available. Call your nearest CSA and ask if they will accept SNAP dollars. More info on CSAs here. Additionally, for tips on how to eat right when money's tight, check out this USDA page. It has a plethora of good information. As spring draws near, the U of M also has a bunch of good tips on how to stretch your (EBT) dollars at farmers markets. Visit any of the 26 historical sites managed by the Minnesota Historical Society for $4. Examples include the Charles A. Lindbergh site in Little Falls, the James J. Hill house in St. Paul, and Split Rock Lighthouse in Two Harbors. You’ll need to fill out a form, plus show a government ID with your EBT card to qualify. More details on their website. Discounts at Children’s Museums. For the museums in Rochester and Saint Paul, you can fill out a simple form to get free admission for a whole year plus $2 tickets for up to six guests on every visit. Duluth’s museum offers $3 tickets for up to 4 people on each visit. Get into the YMCA with a scholarship. The Y makes case-by-case decisions on how much assistance will be granted, but all you need to do is submit an application form and make copies of your EBT card. With a range of classes, numerous locations, and free child care while you’re working out, it’s a great benefit. Pay $1 fares with Metro Transit. Present your EBT card and photo ID at a Metro Transit Service Center or at the SouthWest Transit Station to qualify. The discounted fare benefit will be good for a whole year. See here for details. Receive a free government cell phone or pay less for a network plan. A variety of vendors are available if you would like to apply for a free cell phone. If you already have a cell phone and just need help paying for minutes, T-Mobile and CenturyLink have basic plans or provide discounts for one line per household. Go to the Minnesota Zoo for free. I have not personally visited the state zoo, so I’ll definitely be taking advantage of this perk in the next few months. The general admission fee is waived, but payment is required for special events/exhibitions and parking. Details found here. Discounted prices at The Works Museum. Enjoy hands-on learning on all things engineering, science, and technology. Daily admission is 50% off per person, and family memberships are 60% off. There are also scholarships available for their Gateway Program camps, which are STEM camps for kids 5-12 years old. Details here. Pay $3 for the Minnesota Science Museum. That will cover general admission. If you enjoy Omnitheater shows, get admission + a theater ticket for $5. It is currently Omnifest, so there are currently many options for captivating shows! Watch Guthrie productions for $5. Up to four tickets can be purchased for select performances by phone or at the Box Office. As a theater lover, I’m excited for this! Learn more about Gateway tickets here. Get $5 admission and discounted theater classes at the Children’s Theater Company. Apply and enjoy membership for up to 2 years. Emails are sent out when discount tickets are available for purchase at the reduced rate. You will also automatically qualify for scholarships to all their Theatre Arts Training classes and camps (K-12). These are just the major discounts I could find. Did I miss something? Please comment below or on our ICC page to let me know! This recipe was sent in by Rachel Quay who serves as a VISTA with College Possible. It’s a wonderful vegetarian or vegan take on the classic, meat-heavy Italian sauce. Cauliflower has recently come into vogue for its incredible versatility and as a meat substitute that doesn’t have to try hard to please. Balsamic vinegar isn’t a typical ingredient in traditional Bolognese, but adds a hefty amount of flavor in this preparation. Tinker with the seasonings to your liking since the heartiness of the sauce’s cauliflower and lentil base allows for flexibility. Shred the cauliflower so that it resembles the consistency of cooked ground beef – a food processor or grater works well for this, otherwise patience and a knife will suffice. In a large heavy-bottomed pot, heat the butter or olive oil over medium low heat. Add the onions and cook until soft, about 3-5 minutes. Add the cauliflower to the pot. Increase heat to medium and stir occasionally until the cauliflower takes on a light golden color, about 10-12 minutes. Add the garlic and cook until it loses its raw odor, about 1 minute. Add the canned tomatoes, red lentils, balsamic vinegar, sugar, thyme, basil, oregano, crushed red pepper, salt, and black pepper. Stir until combined, bring to a gentle boil, and finally reduce heat to simmer for about 30 minutes until the sauce thickens and the lentils cook through. Season, garnish, and serve with cooked pasta. CONTEMPORARY SOCIAL JUSTICE READING – 7 BOOKS FOR CAPACITY BUILDING AND SERVICE IN MINNESOTA. As we continue our service through a dull and gray Minnesota February, it can be helpful to reconnect to why we committed to AmeriCorps in the first place with a good book. There are many reading lists online dedicated to the social justice “canon,” but sometimes more recent titles are overlooked in favor of the classics. Some of the below titles have received critical acclaim on the national level (The New Jim Crow, The Hate U Give, and Bad Feminist), others are more regionally important to us serving in Minnesota (The Song Poet and From Somalia to Snow), and a couple are more academic but provide incredibly important ideas (The Impossible Will Take a Little While and Poor Economics). I hope you enjoy these selections! From The Atlantic: “By the time she’s 16, Starr Carter, the protagonist of the book, has lost two of her childhood friends to gun violence: one by a gang drive-by, and one by a cop. America’s most watched sporting event took place just a couple weeks ago in Minneapolis. A third of the country tuned in to the Super Bowl to see the teams battle it out at the US Bank Stadium. I first saw the stadium on my arrival in September, and was immediately taken aback by its unusual shape. The dark, striking sculpture more closely resembled a spacecraft than a stadium. But what interested me more was the story behind the stadium. Many people I talked to had conflicting views on the stadium. Some called it an eyesore; others praised it as a futuristic, iconic landmark and a welcome addition to the Twin Cities skyline. Some bemoaned this use of taxpayer money, while others expected the stadium to bring in more money than it consumed. Intrigued, I decided to take a closer look, and in this article I’ll share my research on the stadium, its history, and some interesting details behind the construction process (since I am a Habitat AmeriCorps cohort member, after all). 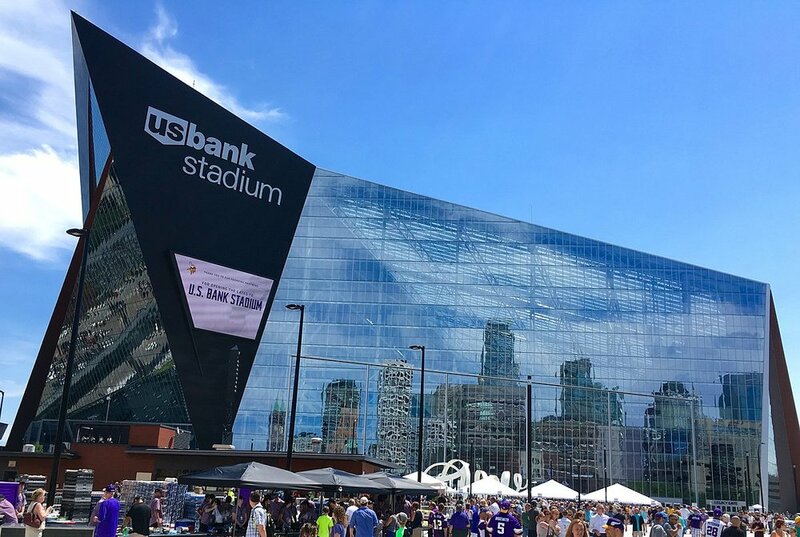 The US Bank Stadium’s architecture was actually inspired by the Norwegian Vernacular style (byggeskikk), staying true to Minnesota’s Scandinavian roots. But its construction brought with it many technological achievements. First, the stadium boasts the largest translucent roof in North America. The slanted wall panels are not only visually appealing, but also help to deflect snow from the roof. However, the reluctance of the contractors to use “bird-safe” wall panels has led to the stadium being the most fatal building in Minneapolis. It took many years of deliberation to finally decide on the Metrodome site for the US Bank Stadium. After the Metrodome was demolished, construction could finally begin on the new stadium. And an impressive 80 percent of season-ticket fans shifted seamlessly from the Metrodome to the US Bank stadium, showing that folks are willing to pay a premium for an enhanced stadium. For all its criticism, the US Bank Stadium has been a relatively well-run project. Unlike the Mercedes-Benz stadium in Atlanta, for example, it ran completely on-budget and found public financing through pull-tab gambling, rather than a sales tax increase. The bulk of the private funding was provided by the Vikings’ billionaire financier and owner and the various team partners. And of course, the completion of the US Bank Stadium paved the way for Minneapolis’ successful Super Bowl bid, which has brought significant revenues to local businesses and the city at large (through the sizeable temporary entertainment tax and the “jock tax”). Not everybody likes the stadium, and as a transplant from LA, I admit I don’t understand Minneapolis history or politics well enough to make a considered judgment. So I’ll leave off with my own personal opinion of the stadium: it is an instantly recognizable icon that brilliantly fuses the cultural heritage of Minnesota with its modern, post-industrial future.